This is one of my all time favorite recipes. It’s so simple-to-prepare, you could give this recipe to a five-year-old and he/she could get the job done. 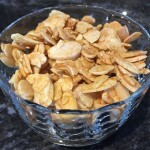 It offers all great things in one simple bite: mild sweetness, a hint of spice, and an addictive crunch. Sprinkled on salad, the recipe takes a salad from ho-hum to five star. They are wonderful sprinkled on this Spicy Asian Salad or Rainbow Buddha Bowl. 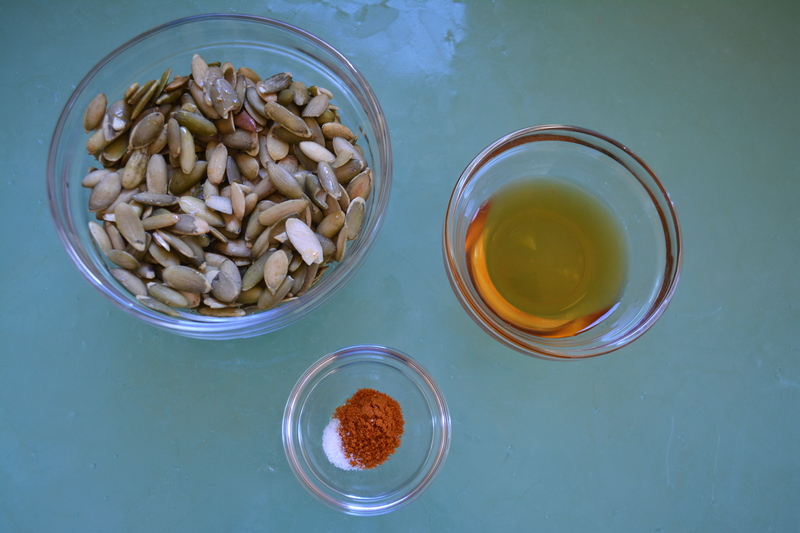 The recipe is wonderful with pecans, almonds, walnuts or another favorite here in Beantown Kitchen, pumpkin seeds. I recommend making a batch of these and then storing them in an air-tight container to be enjoyed for days. 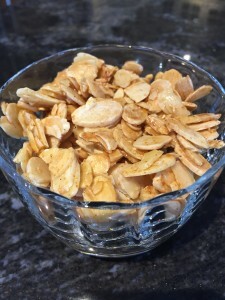 The ingredients for Sweet and Spicy Nuts are easy to prepare. Some nuts or seeds. As you can see, I prepared them two ways. 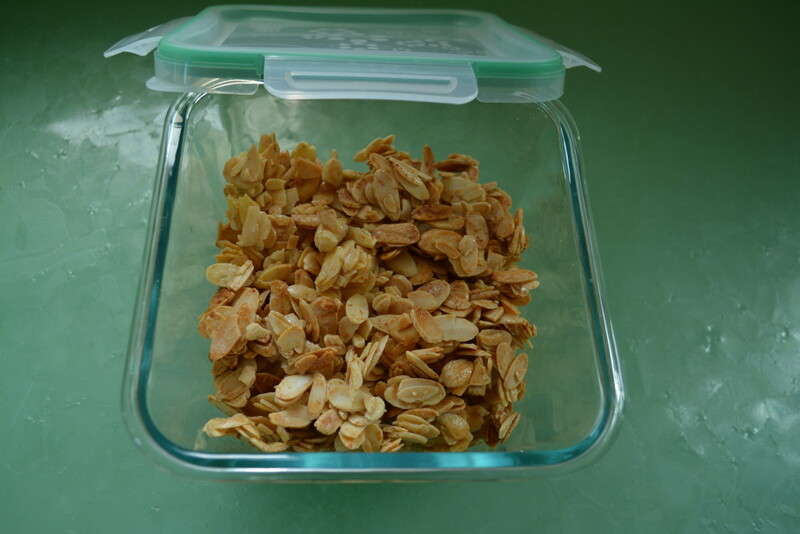 The first time with super iron-rich pumpkin seeds. 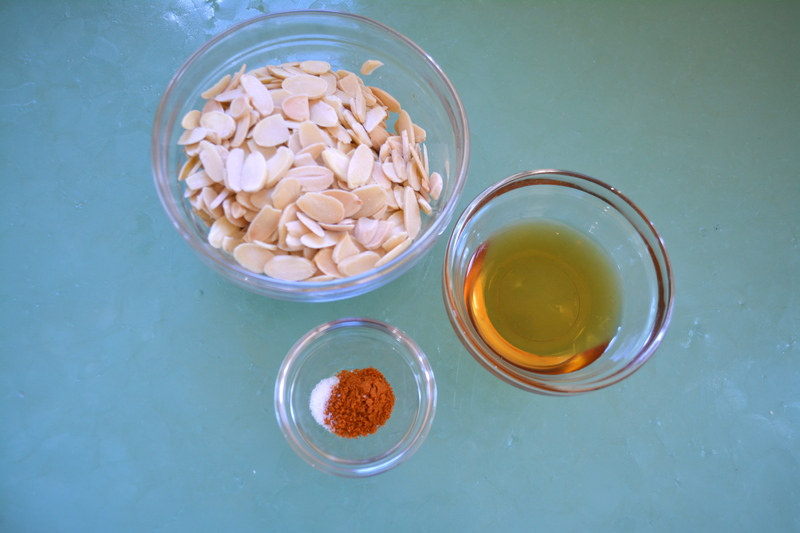 And then I made them again with slivered almonds. The other ingredients are maple syrup, cayenne pepper and salt. The ingredients are mixed together in a medium bowl. And then spread on a baking sheet covered in parchment paper or a silpat sheet and then baked. They will start to brown, harden and become somewhat crunchy. 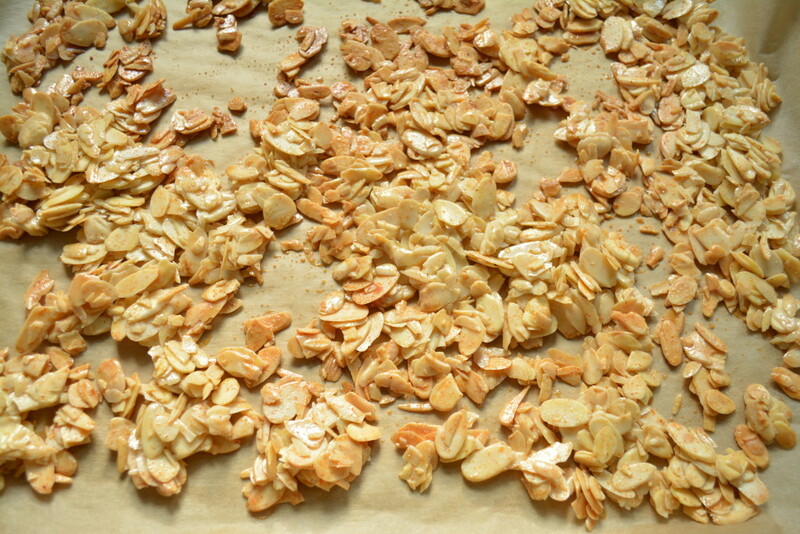 Here is how the almonds look when I removed them from the oven. They continued to harden and become crunchier as they cooled. They are so yummy and crunchy. Any that you can resist eating straight off the pan, can be stored in an air tight container like this in the fridge for weeks. Eat them as a nutrient rich snack or sprinkle them on a salad to really bring it to life. 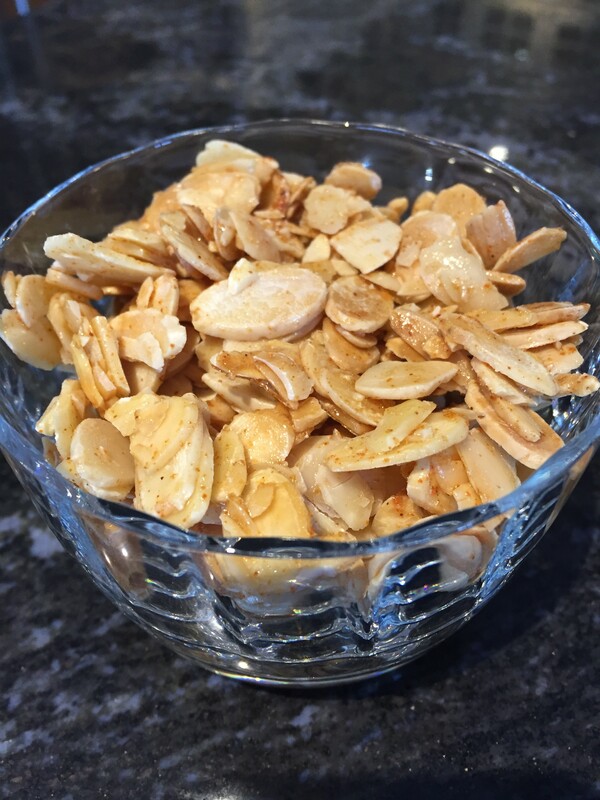 These simple-to-prepare nuts/seeds make a wonderful salad topping or simple snack. Line a baking sheet with parchment paper or a silpat sheet. In a medium bowl, mix together all four ingredients. 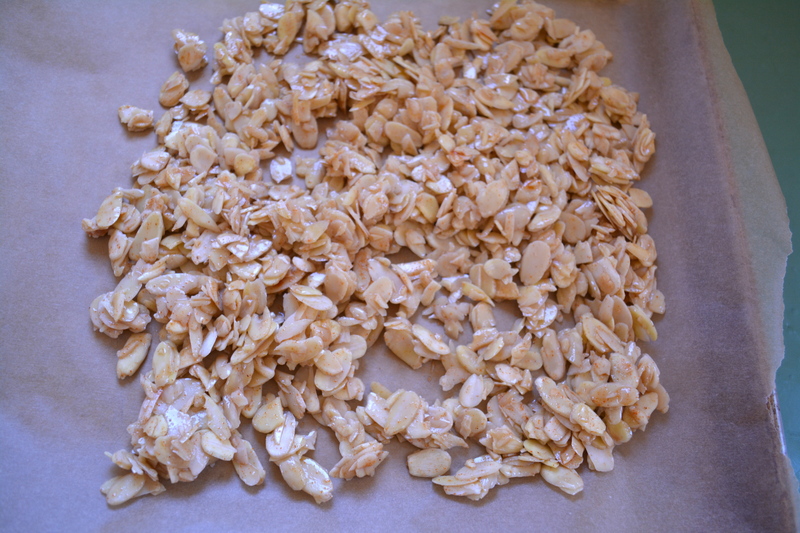 Spread out the nuts or seeds onto the prepared baking sheet. 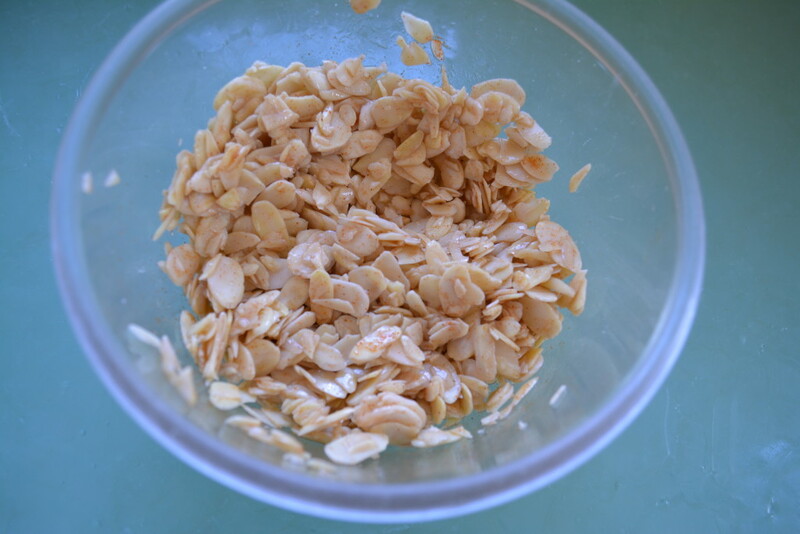 Bake for 8-10 minutes until topping on nuts/seeds start to brown and have become drier and somewhat crunchy. They will continue to harden as they cool. I made a double batch, using 1 c. pumpkin seeds and 1 c. sliced almonds (with maple syrup). They were prepared to take to a gathering, so I put small amounts in paper cupcake liners. They were easy to share and a big hit.